"At 4,200 years ago, there was an abrupt climate change , and abrupt drying, and abrupt deflection of the Mediterranean westerly winds that transport humid air into the eastern Mediterranean region," Harvey Weiss of Yale University told LiveScience. Weiss has been researching the phenomenon, working with other scholars to figure out how broad an event this was and what its effects were. 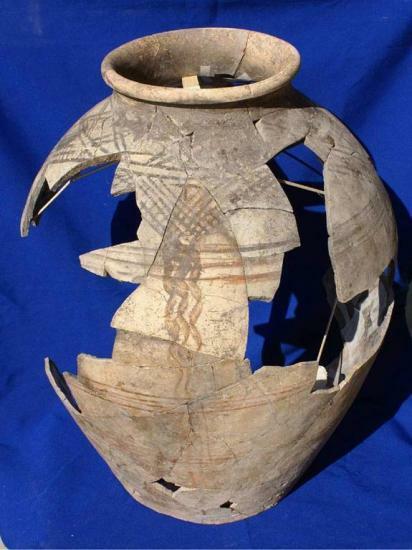 Credit: Photo courtesy Tell Qarqur Expedition - This jar, marked with geometric motifs, dates back to around 4,200 years ago, and represents many ceramics that were created in the city during this time. "That deflection of those winds reduced the annual precipitation across western Asia for about 300 years," he said, with rainfall being reduced somewhere between 30 and 50 percent. This meant that cities in the Middle East that depended on rain-fed crops had a difficult time surviving. The intense drought extended nearly globally, Weiss noted. Along with the Mesopotamian and eastern Mediterranean societies that met their demise, Old Kingdom Egypt, a civilization that built the Great Pyramids, collapsed. "A different weather system reduced the flow of the Nile River at the same period so the Nile was affected," Weiss said. Casana cautioned that not all scholars are convinced that climate change was the main cause for the collapse of cities in the Middle East. "It's a pretty thorny question," Casana said. Some researchers "simply don't like the sort of one-to-one causal story that that kind of narrative tells, in which the rain stopped falling and everybody died," he said, adding that the way people were farming and using the land may also have played an important role. Another factor is the shaky political stability that large states sometimes endure. "There are other scholars who simply think that the decline of these civilizations, at that time, is kind of part and parcel of the story of civilization itself," Casana said. Why did Tell Qarqur survive? The question now is why Tell Qarqur is different. Why did the site survive and expand while so many others collapsed? Casana said that until more excavation is done, the jury will still be out as to why. Credit: Photo courtesy Tell Qarqur ExpeditionA series of houses found at Tell Qarqur appear to have been burnt, though archaeologists aren't certain if this was accidental or done deliberately by attackers. Weiss believes that the Orontes River, on which the city is located, is the key to answering this question. He pointed out that other archaeological sites on the river, including Qatna and Nasriyah, also appear to have prospered during this time of collapse. Credit: Photo courtesy Tell Qarqur ExpeditionThe site of Tell Qarqur continued to be occupied long after the Middle East collapse ended and cities in the region were rebuilt. 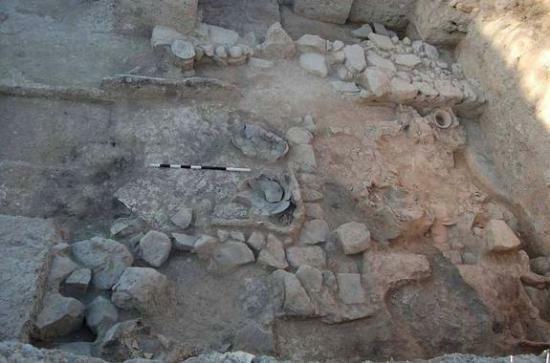 This gateway dates to the Iron Age, more than 2,500 years ago. It was built on top of structures that date back to the collapse, 4,200 years ago. "The Orontes River is fed by a huge underground chamber of water, which is called a Karst," Weiss said. "That huge underground source of water continued to flow and to feed the Orontes River during this period when rainfall was diminished." There are other questions. Before the collapse hit, Tell Qarqur was within the sphere of influence of a powerful kingdom known as Ebla. That kingdom was destroyed sometime prior to 4,200 years ago. This likely changed the way the city was governed and managed, something that future excavations may reveal. "What happens to the political realities of the community at Qarqur I don't know," said Casana. "I'm sure there must have been some change." 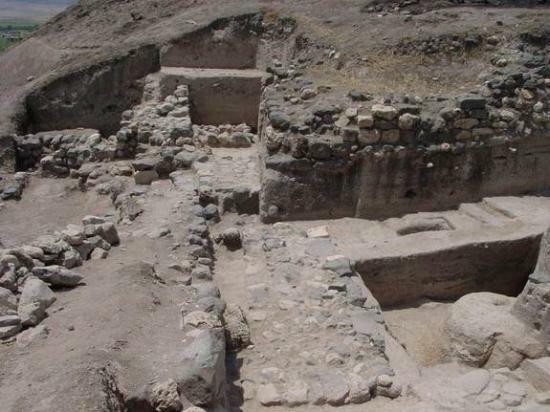 Weiss said that the discovery of cities that grew during climate collapse offers a new frontier for archaeologists and scientists to investigate. "I think that the early bronze four [the scientific name for this period of collapse] culture of the Orontes is only just now emerging for our attention and that it's going to provide an extremely interesting example of cultural growth in unique environments during this period," he said.